A popular web hosting service owing to its features, functionalities and low prices, InterServer is one of the most ideal web hosting for WordPress sites. Its plans are so affordable considering that you get to avail of unlimited storage, transfer, email and free SSL certificates and get to maintain up to 20 websites. You also get to avail of single-click installs for more than 100 scripts for WordPress, Prestashop, Cubecart, Magenta and osCommerce, among many others. The service uses only top of the line equipment in its servers, among them high performance SSD hard drives with capacities of 30 GB to 240 GB. These disks are 20 times faster than ordinary SATA drives. It likewise supports multiple languages and utilizes the latest versions of MySQL, Python, Perl, PHP and Ruby, to name a few. These servers are customizable to suit Linux applications, server solutions or OS components. The service gives you the ability to easily add and manage virtual servers all from the solution’s control panel. Virtual servers can also be scaled with the use of a web-based control panel. InterServer has also been found to have an uptime of 100%, a rare feat among web hosting services. The platform’s use of an intelligent BGPv4 routing protocol, enables it to route traffic to the nearest backbone provider, effectively increasing speed and reducing latency. This is apart from the fact that the company does not overload its servers, which can result in slow site performance. With InterServer, you have access to more resources when you use your servers as the service maintains its servers at around 50% of capacity. It also does not overburden its servers by allowing only 100 new customers a day. Aside from this, the service’s VPS plans are highly-customizable, which include being able to use your preferred operating system, software, control panels and CPU power. What makes things even better is that the vendor only charges you for what you need to use. InterServer offers a 100% power uptime guarantee on colocation and a 99.9% uptime guarantee on its VPS plans. InterServer runs its own datacenter in New Jersey and also rents a facility in California. The datacenter is equipped with features such as UPS power, fire suppression, biometric locks, raised floors, overhead air conditioning, and HVAC. How Much Does InterServer Cost? Intserver provides Cpanel on Linux plans. It is a paid add-on with VPS packages and you need use the right Linux distribution. The host also offers Directadmin. However, Windows servers are not provided with a control panel. Each business is different, and might call for a special solution that will be adjusted to their company size, type of customers and staff and even specific industry they support. We advise you don't count on locating a perfect service that is going to work for every company no matter what their history is. It may be a good idea to read a few InterServer reviews first and even then you should remember what the hosting service is intended to do for your business and your staff. Do you require a simple and intuitive hosting with only elementary functions? Will you actually use the advanced tools needed by pros and big enterprises? Are there any specific features that are especially beneficial for the industry you operate in? If you ask yourself these questions it will be much easier to find a trustworthy service that will match your budget. We realize that when you make a decision to buy Hosting Services it’s important not only to see how experts evaluate it in their reviews, but also to find out if the real people and companies that buy it are actually satisfied with the product. That’s why we’ve created our behavior-based Customer Satisfaction Algorithm™ that gathers customer reviews, comments and InterServer reviews across a wide range of social media sites. The data is then presented in an easy to digest form showing how many people had positive and negative experience with InterServer. With that information at hand you should be equipped to make an informed buying decision that you won’t regret. InterServer provides 24/7 phone and live chat support. It also utilizes a ticket system, knowledge base, forum, and web portal for support. The support agents seem to be based in-house. The support site hosts a news blog as well as a range of social media links. What are InterServer pricing details? InterServer’s datacenters are equipped with state-of-the art security features enabling the host to provide reliable and secure web hosting services. InterServer accepts major credit cards and PayPal. InterServer supports e-commerce solutions like Zen Cart and OS Commerce. It also sells SSL certificates. 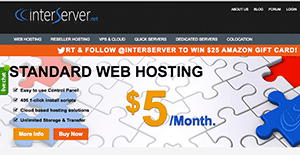 Yes, InterServer offers unlimited email accounts and bandwidth with its Web hosting plans. Yes, it offers both Linux and Windows VPS hosting plans. Do they allow you to easily set up a website with no HTML or coding knowledge? InterServer does not appear to offer sitebuilder software to help novices. InterServer uses Plesk and Cpanel control panels. The host offers a discount on new domain registrations when you buy a hosting package. You can get a free domain with a coupon. Yes, InterServer fully supports WordPress websites and blogs. Interserver offers a 99.5% uptime guarantee. It gives credits to customers in case of an outage. Things started well when I bought hosting from Interserver but soon went bad, very bad. First, my site was in the bottom 2% for upload speeds in Australia, and not good elsewhere. Second, Interserver tehn farmed out their “support” to a terrible 3rd party center in India!!! The support was so bad that they did not even know what cpanel my Interserver account used. So I left them, then their management started posting nasty negative reviews about my business as if they were a customer of mine. Truly, you need to avoid these “people” at all costs.